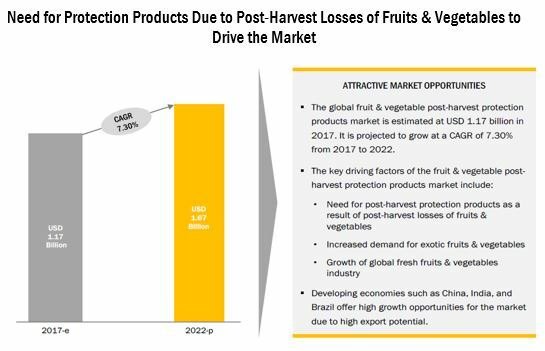 [159 Pages Report] The post-harvest treatment market for fruits & vegetables was valued at USD 1.10 Billion in 2016, and is projected to reach 1.67 Billion by 2022, at a CAGR of 7.30% during the forecast period. 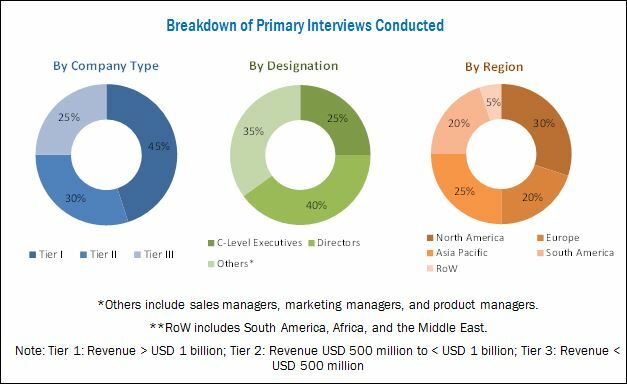 Determining and projecting the size of post-harvest treatment market for fruits & vegetables with respect to the type, application, and regional markets, over the period ranging from 2017 to 2022. Identifying attractive opportunities in the market by determining the largest and fastest-growing segments across regions. The key players have been identified through secondary sources such as the US Department of Agriculture (USDA), the Food and Agriculture Organization (FAO), the European Food Safety Authority (EFSA), the Food Safety and Standards Authority of India (FSSAI), Food Safety and Inspection Service (FSIS) and the European Federation of Food Banks (FEBA), while their market share in respective regions has been determined through both, primary and secondary research. The research methodology includes the study of annual and financial reports of top market players, as well as interviews with industry experts (such as CEOs, VPs, directors, and marketing executives) for key insights (both quantitative and qualitative) for the post-harvest treatment market for fruits and vegetables. The various contributors involved in the value chain of the post-harvest treatment market for fruits and vegetables include raw material suppliers, R&D institutes, post-harvest treatment products manufacturing companies such as Decco (US), Pace International (US), Xeda International (France), JBT (US), and Agrofresh (US), and government bodies & regulatory associations such as the US Department of Agriculture (USDA) and the Food and Agriculture Organization (FAO). This research report categorizes the post-harvest treatment market for fruits and vegetables based on type, application, and region. The post-harvest treatment market for fruits and vegetables is estimated to be valued at USD 1.17 Billion in 2017, and is projected to reach USD 1.67 Billion by 2022, at a CAGR of 7.30% from 2017. The growth of the post-harvest treatment market for fruits and vegetables is proportionally dependent upon the growth of the fruit & vegetable industry. The market is driven by the increase in demand for fresh fruits & vegetables and exotic fruits & vegetables. Furthermore, factors such as growing awareness and need for the post-harvest losses are expected to increase the demand for post-harvest treatments for fruit and vegetables. However, lack of efficient infrastructure for post-harvest mechanisms in developing regions and stringent government regulations in Europe act as a restraint for market growth. Additionally, consumer shift toward the consumption of organic fruits & vegetables and innovative post-harvest treatment solutions are also expected to positively affect market growth. The post-harvest treatment market for fruits and vegetables, based on type, has been segmented into coatings, fungicides, cleaners, ethylene blockers, sprout inhibitors, and sanitizers. The coatings segment dominated this market in 2016 as they help in extending the shelf life, enhancing the appearance, and delaying ripening of fruits and vegetables. The market for cleaners is likely to grow at the highest CAGR, due to its wide application on all types of fruits and vegetables. 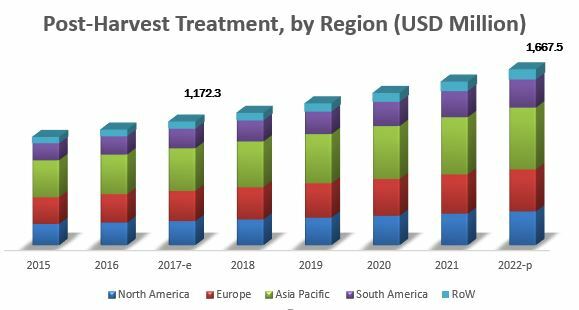 The post-harvest treatment market for fruits and vegetables, by application, has been segmented into fruits and vegetables. The fruits segment had a larger market share. Fruits are commonly climacteric in nature, and hence are highly perishable, which results in wide-scale usage of post-harvest products in order to increase their shelf life, prevent physiological disorders, and prevent excess ripening to minimize losses. The apple subsegment is expected to lead the post-harvest treatment market for fruits. Asia Pacific is the largest and fastest-growing post-harvest treatment market for fruits and vegetables owing to large-scale production of fruits & vegetables and their established export trade. The demand for post-harvest treatment products is likely to grow in this region due to the growing export of fruits and vegetables, shifting focus on reducing post-harvest losses, and growing fruit & vegetable production in countries such as China and India. However, Lack of efficient infrastructure for post-harvest mechanisms in developing regions and stringent government regulations in Europe restrain market growth. The global market for post-harvest treatment market for fruits and vegetables is dominated by large-scale players such as Decco (US), Pace International (US), Xeda International (France), John Bean Technologies (JBT) (US), and Agrofresh (US). Syngenta (Switzerland), Bayer (Germany), DuPont (US), Nufarm (Australia), and FMC (US) are a few other key market players that also have a significant share in the market.